Taipei, Taiwan, June 2017 (Taipei,Taiwan) – Advantech, a leading industrial computing platform provider, is pleased to announce its UTC-542 all-in-one (AiO) touch computer. Powered by a sixth-generation Intel® Core™ i5-6300U processor and equipped with up to 16 GB of memory, UTC-542 delivers excellent high-performance computing. Designed to support diverse interactive display applications, UTC-542 features a 42.5-inch 16:9 widescreen TFT LCD monitor that offers 1920 x 1080 resolution and 450-nit brightness, and can be mirror coated to support smart mirror and interactive augmented reality applications. Rich I/O ports, including 2 Gigabit Ethernet ports, 2 COM, and up to 4 USB ports, increase the system’s extendibility and flexibility, while the IP65-rated front panel and fanless design offer industrial-grade reliability that ensures stable operation. 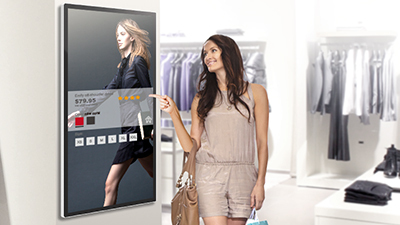 With the provision of Wi-Fi connectivity and multiple OS support, as well as the ability to integrate diverse optional peripherals, UTC-542 provides the ideal solution for interactive signage in retail stores, industrial signage in factories, self-service kiosks in transportation hubs, and information signage in public spaces. Featuring a 42.5-inch 16:9 widescreen TFT LCD monitor that supports 1920 x 1080 resolution and 450-nit brightness, UTC-542 offers a wide viewing angle and enhanced visuals aimed at industrial-grade display applications. To satisfy diverse usage requirements, the UTC-542 system is available with either a clear glass or mirrored monitor. The mirrored model is equipped with a 3H surface hardness anti-glare mirror coating that offers scratch resistance and an enhanced viewing experience for interactive augmented reality applications. Meanwhile, the clear glass PCAP touch model offers unrivalled optical clarity, high durability, and long-term temperature stability. Regardless of the monitor type, both models feature an ultra-thin bezel design (only 21 mm for the mirrored model, and 34 mm for the PCAP model) that maximizes the display space, and an extremely responsive touchscreen that supports multi-touch control to enable simultaneous multi-user operation. Advantech’s UTC-542 AiO ubiquitous touch computer will be available for order from end of July 2017. For more information about this or other Advantech products, contact your local sales support team or visit our website at www.advantech.com.